The traditional drill press is basically made of four main parts – the column, base, head and table. Machine is supported by the base. The column is normally steel made, which grasps the head and table and is fixed firmly to the base. When it comes to determining the type of model, i.e. Bench or Floor, the length of the hollow column comes into play. The height of the Floor models ranges from 65 to 76 inches while the height of bench model ranges from 25 to 50 inches. he base and table must be corrugated for rigidity and strength. The table must have board or slats on the either side, it offers convince and safety while working. The head must be made of cast iron. This provides outstanding protection and support to the significant parts of the machine — the quill, motor, and pinion shaft. There must be an adjustable motor bracket support, and this must be constructed solidly as it supports the motor. It should also be effortlessly movable to ensure appropriate tension on belt. Make sure that the drill press you are going to buy must have an option for selecting the speed for drilling metal(steal, aluminum), wood, glass, ceramics and plastic. Some drills available in the market have an option for 12-15 different speeds, which ranges from 200 rpm to 3,500 rpm. Now that you have gone through the basic features that you drill press must have, you are all-set to buy one! Here we have reviewed 6 high quality drill presses. Let’s have quick review on each of them. Infinitely variable speed ranges from 580-3200 RPMS. Mechanical variable speed delivers equal torque throughout the range. LED read out displays speed. 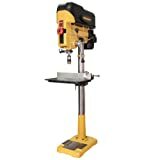 9-1/2 x 9-1/2" cast iron worktable features rack & pinion height adjustment and bevels up to 45 Degree left & right; From the Tip of thechuck to the table lowered of the table 12 3/4"
The WEN 4214 12-Inch variable speed drill press is one of the best products on the market for those who need industrial-level performance in their drillling work. This is a powerful bench top tool that also provides accuracy with its laser centering feature. You can drill quickly and precisely into hardwoods, fiberglass, aluminum, and even cast iron to some extent – depending on the quality of your drill bits. With the right assortment, you can drill very precise holes in almost any material. There is no wobble, so it’s just a matter of finding the right speed. The variable speed is adjusted to anywhere between 580 and 3200 RPM with a single move of the lever. For serious workshops, the WEN 4214 provides just what you want – power and control The table and base are made of durable cast iron. The strong induction motor runs smoothly on ball bearings. It remains smooth and stable even at high speeds. The tile and lock table is secured by a nut (wrench included) to give you some options on complex projects. The sturdy table is slotted for attaching clamps or vices to hold work pieces securely. It’s also easy to assemble and comes with a full set of instructions. We also think this is one of the best drill press for the money. 10 x 16-1/8 inch Cast iron base Fits neatly on work benches with limited space""
For those in need of a versatile bench drill, the Shop Fox is a solid choice. It can drill a variety of materials while boasting numerous bells and whistles to provide further use for a variety of projects. The Shop Fox boasts a 3/4 HP motor and can employ 12 different speeds for any job you throw at it. It comes stock with a 5/8” drill chuck which is generally more than enough for most uses. The table offers ninety degrees of swivel, forty-five on the left and right, for drilling at an angle. It can also swing a full 360 degrees to accommodate any position within the overall work space provided. This drill is equally effective for both wood and light metals. Keep in mind, for heavier metal drilling, you should probably be using a specialized drill. This drill can exchange the bits and serve as a sander as well. The sanding mechanism is further supported by 3-piece spindle sander drum kit with a mandrel of 1-inch, 1-1/2-inch and 2-inch drums. The Shop Fox is made almost entirely of steel with the exception of some of the casing and parts of the motor. For those who require versatility without sacrificing quality–an issue that can be difficult for power tools–this is an excellent option. The Klutch 12-inch Bench Mount Drill Press is a powerful machine built to ensure precision in DIY or smaller professional products. It has a small footprint of about 20 x 10 1/4″, but a comfortable working height of 35 7/8″ with a 3 1/8″ vertical stroke. A roughly 7 7/8″ square worktable is made for smaller pieces, but a 3/4 HP, 120V motor with variable speed makes for smooth drilling in most materials at 480 to 3,600 RPM. The worktable swivels to 45 degrees for angled drilling, and there’s a 12″ swing for more flexibility on your drilling projects. A depth lock with a convenient knob handle adjustment makes for better control. It uses a 5/8″ chuck with built-in chuck storage. The drill press comes with an easy-to-read digital display for greater accuracy. For the typical hobbyist or home DIYer it’s a precise, powerful, and easy-to-use drill press. The Klutch 12-inch drill press runs smoothly and quietly. It does everything a bigger and more expensive drill press can do, but on a smaller scale, and with consistent results. It does require a little setup, but comes with a full instruction manual, wedge, two Allen keys, and four bolts for easy mounting to your worktable. At a very reasonable cost there’s no wobble or rattle, just neat, accurate drilling and comfortable operation. The Woodtek 109367 is a traditional drill press based on designs which have proven effective for decades. Similar models have been in production since the 1950s, and it is an example of “if it isn’t broke, don’t fix it” engineering. Thus, the Woodtek is ideal for those who have straightforward drill press needs and don’t require any advanced hardware. It is also ideal for beginning woodworkers who need a simple machine they can quickly understand. Because of its simplicity, the Woodtek 109367 is also cheaper than a lot of comparable models. 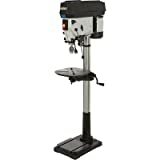 At about 62 pounds in weight, many people would not consider this drill press compact or lightweight, but it is in fact much smaller and lighter than other units. Its 29.5″ height, 19.5″ length and 10″ depth mean that it is small enough to be mounted in most places. Its very simple design has few parts to break down, with easy access for changing said parts. The V-belt method of transferring power from the motor to the drill bit is reliable and comparatively quiet, although using ear protection may still be advisable. The half horsepower motor is sufficient for most jobs, and the five speeds, varying from 720 RPM to 3,250 RPM, are ideal for numerous woodworking applications. It has a 10-1/8″ swing and a 2-3/8″ stroke. The Woodtek 109367 is not designed for the highest precision work, but it has a large 6.5″x6.5″ work table that is ideal for most woodworking projects, and even some involving aluminum, steel, and other metals. Because of its long production period and simple design, there are numerous accessories compatible with this drill press, which makes it easier to adapt to specialized jobs. Woodworking or drilling is a task that certainly needs not only concentration but also precision. If you are having a drilling task, one of the great tools it is advisable you use is JET 15’’ 3/4 Horsepower 115 Volt Bench Model as it can serve you in varying ways. 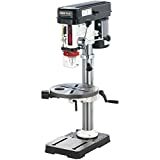 This model of drill press has a simple design yet it is a very powerful tool with extraordinary features that will make you achieve the accuracy level you are always craving to have when drilling. 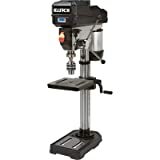 The JET 15’’ 3/4 Horsepower 115 Volt Bench Model is a kind of drill press which has a base that is modified in a way that makes the tool to be able to be well positioned in place thereby providing a firm foundation for woodworking. The base of this drill is well-made and therefore you do not have to worry about the tool sliding or even falling when you are using it for drilling purposes. If you are craving to have a greater precision as well as accuracy when drilling, the JET 15’’ 3/4 Horsepower 115 Volt Bench Model is the best tool for you. Its bordered spindle assembly acquires support from several ball bearings that are greased permanently so as to make the user end up attaining great precision and perfection when handling his or her different drilling projects. This tool is quality and hence reliable to be used for a range of varying woodworking projects not to mention that it is durable and hence can service you for several years with little maintenance. The Grizzly G7945 5 Speed Bench Top Radial is another model of the drill which is very dependable because it can give out top-notch results despite the kind of drilling task it is being applied on. From metal sheet drilling, timber polishing to the drilling of holes, Grizzly G7945 5 Speed Bench-Top Radial Drill Press is a quality and reliable tool that will not disappoint provided it’s used accordingly. The tool is an amazing all-round power drill and can assist you to be able to handle your drilling tasks in an efficient way while utilizing only little of your energy. 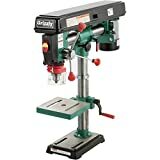 The Grizzly G7945 5 Speed Bench Top Radial is a unique tool that can also be used for making horizontal drilling in whatever form of angles the user desires. This is possible since the tool has a variable sway of up to 34’’. The other amazing fact connected with this tool is that it controls its drill bit thereby ensuring it offers good safety to the individual utilizing it. Its powerful motor possesses a great energy capacity making it possible to operate the tool with only a little effort. Grizzly G7945 5 Speed Bench Top Radial is the right tool you should consider using if you want to make holes in a very long board as it will ensure you are able to slope you work-piece in whatever angle you wish. 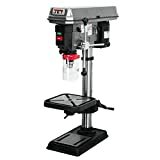 Provided you buy this tool from a reputable purveyor that you know has only high-quality drill presses, Grizzly G7945 5 Speed Bench Top Radial model of the drill is a valuable investment which can stand the test of time and serve you for some years. The Craftsman 12’’ Drill Press is a type of tool that can allow its user to perform drill speeds for various uses. When using this tool, you can adjust its LED gadget in order to improve your general visibility. Therefore, this drill can help you view your drilling project as you wish simply by adjusting appropriately as you want its LED device. When using the 12’’ Drill press, you do not have to worry about the tool falling or skidding since it has a stable base which will ensure it is maintained in any position that you place it on. The different speed setting choices this drill model provides is a top-notch feature which will ensure you are able to drill any type of staff in a smooth way and with only little effort. Provided you secure this tool from a genuine supplier that has original and quality items, be guaranteed that the drill will with no doubt serve you for several years without experiencing any reasons to be replaced. DEWALT DWE 1622-K 2 Speed Magnetic, 2-in. Drill Press overload protection electronics and therefore prevents the possibilities of motor damage. It has a magnetic coolant bottle that can be positioned on any of its sides or even on the work surface. The 4- 3/8’’ Drill travel capacity provides maximum potential for hefty duty applications. The drill press you use should always be as accurate as possible. If your drilling project requires just boring holes on wood, you can consider utilizing an ordinary power drill or hand drill. However, for you to ensure preciseness without using a pencil or measuring tape, using DEWALT DWE 1622-K 2 Speed Magnetic, 2-in. 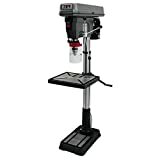 or SKIL 3320 01 3.2 Amp 10’’ Drill Press is recommended. These tools will guarantee you precision calibration, width or hole size, depth, etc. They have a powerful motor that ensures they can easily bore via tough materials while utilizing fewer rotations. They can help you bore via hard or dense wood without getting damaged or breaking your workpiece. Both of these tools provide more top speeds and therefore are suitable for drilling through more stuff. If you want to make perfectly aligned holes on wood, consider using any of these press drills and be assured you will attain great outcomes in a quick and safe way. The SKIL 3320 01 3.2 Amp 10’’ Drill Press has a 1/2 –inch keyed chuck which allows easy tightening and loosening of the drill bit’s jaws. This tool is a kind of versatile drill that runs at 5 speeds. The Drill Press can go as lower as 570 RPM and as higher as 3,050 RPM. Courtesy if its convertible depth stop, this tool can enable you to perform precise measurements and accurate repetitive drilling. The work surface of this tool can be tilted from left to right at 0-45 degrees. The drill press you use should always be as accurate as possible. If your drilling project requires just boring holes on wood, you can consider utilizing an ordinary power drill or hand drill. However, for you to ensure preciseness without using a pencil or measuring tape, using the SKIL 3320 01 3.2 Amp 10’’ Drill Press is recommended. The WEN 4227 17″ stationary drill press is engineered to meet the requirements of both professional and DIY users. It stands about 65″ tall assembled, has a 4.75″ spindle stroke capacity, and a sturdy 14″x14″ cast iron table that allows a full 45-degree pivot. It can also be pulled up to 26″ away from the spindle to accommodate larger work pieces. The strong 13-amp motor can power through 12 pre-set speed stops from 180 to 2,940 RPMs. The work light and X-shaped laser pointer allow you full vision and pin-point accuracy when drilling. The chuck accepts from 1/8 to 5/8 bits with a storage compartment to ensure the chuck key is always close. A cast iron base and frame give the WEN 4227 some durability and weight (200 pounds) so it doesn’t crawl away under vibration. WEN also provides great tech support and a 2-year warranty. Whether you’re new to drill presses or experienced, the WEN 4227 should be just what you had in mind for your shop. The instructions may be a little confusing for the mechanically challenged, but it’s not hard to work out, and WEN support is available to help. It’s important that setup be done with attention to detail to avoid any wobble in your drill bits or offset with the laser. What you want ideally is a variation of less than .001″, and the 4227 is precision-made to give you that. The WEN 4227 is a very solid drill press that can handle nearly any drilling requirements with ease. Based on the quality of construction, you should get many years of use out of it. The 4227 sells for half the price of comparable drill presses – at this price, you can’t ask for more and could be one of the best drill press for the money. Wood workshops and enthusiasts who wish to have a professional DP in their workspace, this Delta press will fit right in. With all the features such as 16 speeds drilling functionality, efficient performance with the auto tensioning belt drive along with a powerful motor and wide table, this product sets the benchmark for all others. With LED illumination, ultra precise depth scale and depth stop, precision is never a problem with this product. The Delta 18-900L has all that you would need and can be easily considered among the best drill press available. The 6 inch quill travel of the Delta 18-900L is efficient and smooth. The spindle nuts are designed in a way that they can be moved easily without turning. With a stainless steel finish and smooth operation, the Delta 18-900L performs well and looks good at the same time. The speed changing is much easier and efficient with the auto tensioning belt. The Powermatic PM2800B 1792800B is the woodworker’s dream DP. The number of features on the Powermatic push it’s capabilities beyond the competitors. It features an expandable work table, the largest available on the market, can be rotated a complete 90 degrees to allow the operator to adjust the table to meet the needs of the application. The single phase 18 inch, 1 horsepower electric motor is infinitely variable, which allows for drill speed changes without stopping the motor or changing a belt. Powermatic designed the PM2800B for easy set-up and operation. Twin LED lights mounted near the spindle provide ample light in every situation without having to move a large light constantly to see the workpiece. The plunge depth is easily and quickly adjusted with the press of a button, something revolutionary on drill presses not intended for the metal shop. Even though designed for the woodworker, the Powermatic can handle heavy metal drilling with ease. The ease of use is unprecedented and ideal for woodworkers with a high piece output. It has all the features any operator could want and it’s medium size makes it welcome in any shop. The PM2800B is a must have drill press for every woodworker, whether a hobbyist or a professional operating a commercial shop. If you need a real workhorse of a drill press for your home or professional shop, you should take a good look at the JET JDP-20MF. This is a solidly constructed 20″ floor drill press weighing in at 325 pounds. The steel table is held in place by two large bolts, and has plenty of work room at 16″x18″. The sturdy base and very solid construction makes it capable of withstanding some heavy jobs and rough treatment, whether it’s professional wood working or drilling steel pipes. The table comes with it’s own clamp for securing pieces, tilts up to 45 degrees, and can be raised or lowered by hand crank to accommodate differently sized projects. This crank is easily disassembled for cleaning and greasing. The JET JDP-20MF has a strong 1.5 hp motor that can run from either 115 or 230 volt outlets. You can adjust the variable speed to 12 different settings between 150 and 4,200 rpm. This gives you a lot of control in drilling different materials, but for even more torque when needed you can simply flip open the cover and switch between belt or pulley drives. It can also comfortably drill through cast iron up to an almost 2″ depth. The Klutch 17in is a high-end, floor-mounted drill press designed for both heavy-duty and precision work. As befitting a high-end unit, it is very versatile, with a lot of options and extras that enable it to handle a lot of highly specific jobs without the need to purchase additional options. Many of the extras, such as the unit-mounted light, are small touches that make the unit just feel that more useful and well engineered. However, that doesn’t mean that the Klutch is designed just to look and possibly feel advanced, it is a genuinely advanced unit suitable for any serious woodworker. This drill press is built around a 1.5 HP electric motor that is capable of drilling through almost anything and is 2x-3x as powerful as most models. The variable speed, going from 600–2,400, offers extreme flexibility for a multitude of jobs and ensures that tough materials pose no obstacle while lighter materials will not be cut through too fast. The massive 14″x14″ worktable makes the Klutch ideal for large jobs, as does the 17″ swing and 6″ drilling capacity. It can take drill bits of up to 1″ in diameter. At almost 240 lbs, it is capable of being completely freestanding and is heavy enough not to move under most applications without the need to add additional bracing, although it can be permanently mounted to a floor or work surface relatively easily. This Klutch drill press is ideal for any dedicated woodworker or professional shop since it is designed to work hard, consistently, for many years. Additionally, the large work surface that can be tilted up to 45 degrees and has mounting points to secure wood, metal and steel pieces is ideal for putting specific holes in specific objects. While a bit too large and unwiledy for small delicate work, it is ideal for industrial projects and would be at home in any shop that requires a heavy duty machine. A trepanning attachment looks like a small protruding nail extending from a flat disc. In effect, it is a gouging tool, designed to enable the removal of wood from a surface in a circle. However, this is not merely for carving circular indentations in the wood. The primary use for trepanning attachments is to enable a cylindrical piece of wood to be cut out as a flat disc, as well as decorating that disc. Many wooden playing pieces, such as checkers, the base of chess pieces, crokinole discs, and others, are created using a trepanning attachment. Such attachments are also ideal for making wooden feet for a piece of furniture, or for ensuring an existing foot is a proper size. Every good woodworker has a hand-mounted sanding tool to touch up small areas, especially on decorative woodwork which is highly likely to be touched by the hands. However, with the use of a sanding drum, it is possible to clean up an item drilled by a drill press without even removing it from the work table. Drill presses can also spin faster than most hand-held devices, and have more precise RPM controls, enabling for deeper or smoother sanding. This makes it ideal for thumb holes or parts of toys which will be handled by children, and thus must be smooth and free of potential splinters. It can also be used to sand wood against, which is great for smoothing the tops of small pieces. Most drill presses can’t make a very large hole – indeed, getting past a quarter inch is rare, outside of using a saw attachment. And such attachments tend to make large, imprecise holes, suitable only for low precision jobs, unlike what is normally required for prototyping or artistic work. Turning a small hole into a large one using a boring bar ensures that the hole is very precise and exact in size, as well as smooth in the interior. This makes a boring bar great for large, precise holes, such as those used in boats or restored automobiles. Drills have been used since very early in human history for all sorts of activities ranging from boring, reaming and drilling holes. Drill presses are a common denominator in the fields of metalwork and carpentry and are a common sight in most workshops. They are essentially machines for drilling holes that can be set up on a stand or bolted to a bench or the floor. They will generally have a pillar or a column, a base, a spindle as well as a drill head. A table or work bench can make a handy base to attach the drill, as can a stand made of metal or simply just bolting it to the floor. Various accessories that can be added onto the drilling machine make it useful for tasks such as buffing, shaping, sanding and grinding. Drill presses come in several forms with the most commonly used ones being the bench-top model, the floor-standing model, the magnetic model and the radial model. Each model has its differences from the other, mostly in terms of power requirements, capacity, affordability and portability. For instance, a consumer who requires a more powerful drill with a wider variety of accessories would do well with a floor-standing model. A consumer who requires a simpler machine on the other hand for home use and simpler tasks would appreciate a bench-top model more. A magnetic machine while being more powerful than the floor model or the bench press model is more portable and easier to get from one location to another. A radial model will bore angled drill holes since it drills with a tilted head, and it offers a wide swing meaning that it is very appropriate for cutting through broad or thick materials. While the bench-top model and the floor-standing model are more affordable, the magnetic model and the radial model require more of an investment. Preference for the drill press is mostly as a result of its accuracy in drilling holes of a certain depth or any specified width apart as opposed to the hand-held drill. The fact that it is stationary makes it possible for the consumer using it to drill consistently and steadily, thus the improved accuracy. The handle has three arms which control the upward and downward movement of the head allowing the user more control and ensuring ease of use. A drill press or bench press as it is otherwise called requires much less effort on the part of the user since it is motor operated. Before deciding to purchase a drill press, it is important for a consumer to take into consideration the various models and their own particular requirements. This makes it easier for them to make an informed choice. Some of the factors to consider when looking at the models and their features are the sizes and types of materials that the consumer works with. It is also important to take into account floor space and the density of the metals that the consumer works with, as well as the frequency with which the consumer drills angled holes. The pillar is a very stable column that supports the sleeve and spindle of the drill. It is almost always circular and made of solid material. The worktable is usually attached to the pillar. The base holds the whole machine up and as such, it determines the accuracy of the drill press. When the base is mounted properly either on the floor or on a table, it minimizes vibration. This is especially so in the floor-standing model. The spindle is the part of the machine that holds the drilling bit or other cutting tools, while spinning in a sleeve. On most machines, the spindle is upright. The quill is also referred to as a sleeve. While the spindle continues to spin, the quill can either be raised or lowered and pressure can be varied by hand or motor to determine the depth of the cut. The head comprises of the quill, the motor and the spindle. It is attached to the column, allowing it to be moved up and down in order to vary the depth of cutting as desired. The worktable is portable, thus it can be appropriately adjusted to suit the length or tilt of pieces being worked on as well as height adjustment for the convenience of the user. It can be tilted either vertically or horizontally. A majority of work tables have slots for holding work accessories. There are two important considerations that a consumer should take into account when looking to acquire a drilling machine. These are the unit’s swing and the stroke. The size of a drill press is determined by the distance from the drill to the column. This is called the throat depth. The calculation for the drill size is done by multiplying the throat depth by two. For instance, if the distance from the drill to the column is 6 inches, the drill can reach the center of a circle with a diameter of 12 inches. The figure that is obtained indicates the width of cutting material that the drill press can accommodate. This is called the unit’s swing. The stroke, also referred to as the quill stroke determines how deep one can drill. For each of these drill press models, sizes vary based on the functionality of the model. Bench-top models have a swing of between 10 and 12 inches, and a stroke of 2 to 3 3/8 inches. Floor-standing models have a swing ranging between 15 and 17 inches and a stroke of 3 to 6 inches. Magnetic models have a stroke ranging from 4 to more than 8 inches. Radial models have a swing of 24 inches and more, allowing for drilling and cutting of broader materials. Now, as the drills are tool used in workshop, they also are available in different types and all of them differ in size, capacity, purpose, and cost. So, if you are about to install a workshop, then we would advise you to go through the different types of presses along with their uses to make sure that you have installed the right tool in your workshop. The presses can be broadly classified into two major types including the standing or floor presses and the bench presses. Both the drills serve different purposes and thus have different capacity and dedicated works. Let us have a closer look to the types of drill presses, which would make it clear that which press should you buy and install in your workshop. The floor or standing drills are the first choice for those who plan to deal the large projects and manufacturing process in their workshop. These drills can be installed directly on the floor and thus provide better support to the model. With capability of 14-20 inches swing, and up to 16 speed levels, the floor drills are much more powerful and reliable than the bench top, or any other type drill press. The wide range of speed selection helps the worker to get more precision and control over the model being made. Apart from the small workshops, the floor drills are also quite suitable for home purposes. The second type of the drillpress that you can easily see at small especially wooden workshops are the bench top drills. These drills are relatively smaller than the floor drills and can be installed directly on the worktable. Moreover, as they are small, they obviously have less capability. Specifically, the bench top drills are capable to produce swing of 8 to 12 inches and can produce stroke of maximum 3-3/8 inches. Capable to operate with the horsepower of 1/4 to 1/3, the bench top presses are perfect for manufacturing the wooden models. In short, if you are planning for a wooden workshop then you can opt for the bench top drills, which will eventually reduce your cost of investment, and you can gain more profit. Apart from these two types, the other types of drills are upright sensitive, multi-spindle and redial arm. Out of these, the radial arm drill press is most suitable for large projects and can handle the bigger things that are practically not possible for the bench type drill press. Choose the drill according to your use, and manufacturing plan. As if you choose the wrong drill, you can end up with increased cost of investment, which is definitely not desirable. Know your needs before buying the drills so that you can find the right press for your workshop. The principal advantage of a DP is its accuracy. The design of it allows it to drill at precise angles to the work piece. It is also able to drill holes of identical depth, size and position. When working with it, less effort is required to apply the drill to the work piece. The operator has considerable mechanical advantage because the movement of the spindle and chuck is by a lever working on a pinion and rack. The operation is much more secure because the table of it allows a clamp or vise to position and lock the work in place. The holes can be drilled repetitively and accurately because the angle of the spindle is fixed in relation to the table. A change in drill speed can be achieved by moving manually a belt across a stepped pulley arrangement. Most of the modern drill presses can also use in conjunction with the stepped-pulley system a variable-speed motor. It is a very practical option for drilling holes into wood. They make drilling easy and help woodworkers to achieve greater accuracy and usually found in any woodworker’s shop. It provide good versatility, being capable of doing more than just drilling holes. It can also be used for miscellaneous workshop tasks such as polishing, honing, or sanding by mounting honing wheels, sanding drums, and various other rotating accessories in the chuck. It comes with a powerful motor that saves a woodworker’s energy. A DP’s powerful motor also enables using very large drill bits for wider holes. It provide good functionality and enable woodworkers to accurately drill angled holes. This ability to drill at angles another advantage of it. It can also be used for drilling holes in furniture legs and other intricately shaped pieces of wood. Another important benefit of it is the safety and security provided. Woodworkers have good command over the drill bit, due to the variable speed feature. This helps to ensure the safety of the operation, preventing the drill bit to break during use. The vice or clamp that secures the piece of wood to the worktable also ensures the safety of the operation, by preventing the wood from slipping. The flexibility of the DP tool is determined by the distance between axis on which the spindle of the drill turns and the supporting column at the rear, as well as the size of the throat. The most common size of the throat is seven and a half inches and because they will cut to the center of a fifteen-inch work piece such drill presses are referred to as fifteen-inch models. The length of the hit and the length of the column determine the depth of cut. Freestanding presses are longer than bench top models. Both freestanding and bench top models feature heavy cast-iron bases. The worktable slides along the column and the travel is much greater in the case of the freestanding models. Some models allow drilling angled holes by tilting the worktable. Bench drills are usually powered by electric motors that are installed behind their columns. Depending upon where the depth stop is set, the throw of the drill is adjustable. Horsepower ratings range from one sixth horsepower to two or more horsepower, depending upon the size of the drill. The versatility of it depends on the variability of the drill’s speed. Higher speeds are suited to cut wood, while slower speeds are suited to cut metals. There is a remarkable range of attachments for it, including brad point, spade, extension, twist, plug cutters, Forstner drills, router bits, rotary rasps, mortising attachments, and dovetail groovers. All these best drill press models are popular among professionals, come with a good set of features, and provide good value for your money. In terms of features and specifications, our top choice is Delta 18-900L 18-Inch Laser. The best value for your money is SKIL 3320-01, as it comes with 85 percent of the features you will ever need. However, selecting the most suitable DP for your work depends on your specific requirements and the materials you usually work with. It can be excellent for me and horrible for you. Only you, the buyer, can know which it is truly the best for you. 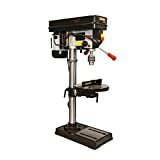 How to Use a Drill Press? One of the most important tool used at the wood shops are the drill press. But many people usually get stuck on how to use the drill press, let’s list out some of the way. It is important to select the appropriate drill diameter at the time of drilling a hole. Then you can choose any machine drill or the wood drills. Wood drills work best with a spiral kind of cutting side. And when compared with the mechanical drilling press it can’t run fast when you work with bolt. Some drills come with a crank for adjusting the height of the table while others can move freely after the release of the clamping level. Set the table to the desired height as per the operation you need to perform. Sometime you may not need to adjust the gauges depth, especially if you are just drilling a hole on a piece of stock. On the other hand, depth gauging is important if you are dealing with stopped holes of fixed depth, reduce the bit to the desired height, then adjust the pair of Knurled nuts at the depth gauge to the correct stopping point. One of the pair should stop the spindle while the other lock in place the first nut. Fixing the work piece in place is important starting to operate the drill press. The drill bit rotation may try to spin the metal or wood work piece, this calls for the need to clamp the worktable, brace it against the supporting column that at the rear of the machine. You should not operate the drill without anchoring the workplate. 1. Make sure that the drill press is either securely fixed to the work table or to the floor depending on what model you have.2. Always use a vice or a clamping kit. The vice must be properly secured to the adjustable table.3. Make sure that the belts are in their correct position on the pulleys and that the tension is correct. The top cover must always be securely closed.4. The drill bit must be properly secured in the chuck by using the chuck key that is provided. It is always better to do the securing of the bit by moving the chuck to at least two of the guide holes in sequence while securing with the key.5. The work piece that you wish to drill into must be securely held by the vice or clamping kit.6. It is advisable to mark the exact spot that you wish to drill into with a center punch. This will help you to line the drill bit up so that you drill the hole in the right place.7. Select the correct speed and then use the side feed handles to engage the work piece. The pressure exerted must be steady and consistent for maximum efficiency. Drill the hole to the required depth or through the work piece. Never stop and start while drilling as this leads to heat build up. The drill must be withdrawn from the hole before stopping.Your drill press requires very little maintenance. Make sure that you clean up especially on the table. Check the belts for wear and tear and replace when necessary. On the safety side you should always wear safety goggles and protective gloves while drilling. No long sleeved shirts or jackets should be worn. Always switch the machine off at the wall and if you can, remove the plug when you leave your work place. So you can see getting the right drill press that suits your requirements can be a hard hitting and a confusing decision, since there are a lot of significant factors that have to be considered. Therefore, it is strongly recommended that when you are choosing the ideal drill press for your work place, it is essential not to consider only the price factor, make sure you give a complete thought on the kind of work and efficiency the drill is offering. 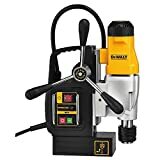 With these top of the class drill press reviews, you might surely make a great decision and buy the best drill press for the money and the product which suits you the best.